Black abstract is the perfect choice for comforts. Made with the ultimate soft silk , black abstract features quarter sleeves to beat the seasonal weather . Whether it is an occasion or just a normal day , black abstract is the smart choice! 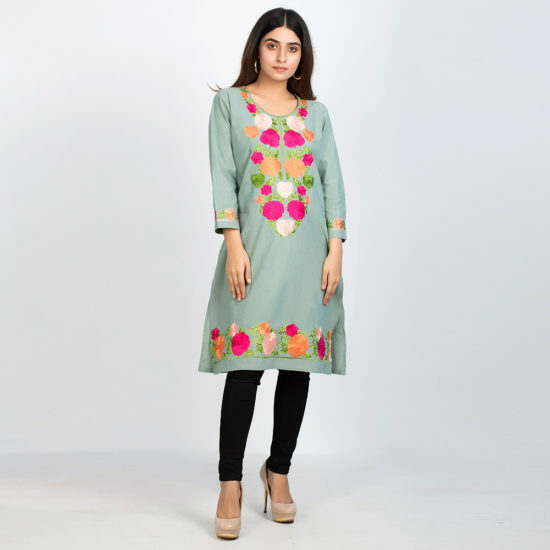 Stunning and Dazzling, inspired with Spring’s blooms and its composition as embroidery for awe-inspiring and chic look, featuing floral embroidery on neck, bottom and sleeves on distinct Green Chambray Fabric.